The Chicken Recipes Kitchen (The home of delicious chicken recipes) invites you to try Baked Chicken with Onions & Leeks Recipe. 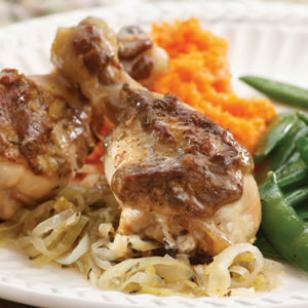 Enjoy our collection of quick & easy recipes and learn how to make Baked Chicken with Onions & Leeks. Toss onions, leek, garlic, 2 tablespoons oil, thyme and salt in a large bowl until the vegetables are well coated. Spread the mixture in a nonreactive 9-by-13-inch baking dish (see Tip). Place the chicken pieces on the vegetables. Bake for 10 minutes. Whisk mustard, shallot, rosemary, soy sauce and pepper in a small bowl; gradually whisk in the remaining 1 tablespoon oil. After 10 minutes, brush the chicken with the mustard glaze. Continue baking until an instant-read thermometer inserted into the thickest part of a leg or breast (without touching bone) registers 165°F, 30 to 45 minutes more. Serve the chicken with the vegetables. A nonreactive bowl or pan—stainless-steel, enamel-coated or glass—is necessary when cooking with acidic foods, such as lemon, to prevent the food from reacting with the pan. Reactive pans, such as aluminum and cast-iron, can impart an off color and/or off flavor. Per serving: 261 calories; 13 g fat ( 3 g sat , 8 g mono ); 78 mg cholesterol; 8 g carbohydrates; 0 g added sugars; 26 g protein; 1 g fiber; 324 mg sodium; 335 mg potassium.